A timely immune response is crucial for the effective control of virus infection. The influenza virus NS1 protein interferes with the expression of key proinflammatory cytokines from infected cells in vitro. To investigate the effect of NS1 during the onset of immunity in vivo, we systematically studied the early events that occur in the lungs and draining lymph nodes upon infection with influenza virus. Strikingly, no sign of innate immunity was detected in the lungs for almost 2 days after infection until a sudden inflammatory burst, including IFNs, cytokines, and chemokines, occurred. This burst preceded the robust dendritic cell migration and T cell activation in the lymph nodes. An NS1-deficient virus triggered rapid inflammation in the lungs whereas a wild-type virus did not. Thus, we demonstrate that, in vivo, influenza virus uses the NS1 protein to replicate for almost 2 days after infection before detection by the immune system. Initiation of adaptive immunity to influenza virus requires professional APCs such as dendritic cells (DCs)3 that mature in response to virus stimuli or to cues produced by infected cells (1, 2). Matured DCs migrate to the regional lymph nodes where they trigger the proliferation of naive T cells and their differentiation into effector cells (3, 4). However, the stimuli and conditions required for in vivo DC activation during influenza virus infection remain controversial. Studies using mouse and human DCs in vitro demonstrate that upon infection influenza virus blocks many features of DC maturation, including synthesis of the antiviral cytokine type I IFN together with a broad range of inflammatory cytokines (5, 6, 7). Moreover, virus-infected DCs fail to up-regulate surface MHC class II and costimulatory molecules such as CD80 and CD86 that are pivotal for T cell stimulation. This inhibition is mediated by the virus-encoded NS1 protein, which is critical for the fitness of the virus because recombinant influenza viruses lacking the NS1 protein (Δ-NS1 virus) are incapable of replicating efficiently in immunocompetent animals (8). However, despite NS1 antagonism, antiviral immunity and viral clearance are successfully accomplished during influenza infection (9, 10, 11). Thus, we set out to investigate this apparent contradiction. In the present study, we analyzed the progression of early events occurring in the lungs of mice infected with aerosolized influenza virus that lead to the onset of immunity. In this model, virus particles are delivered to the lower respiratory tract where they establish an infection that progresses to an acute lethal disease that mimics a natural infection. Our data demonstrate that the initiation of lung inflammation does not begin until almost 2 full days after infection, when virus replication reaches its apex. The migration of lung DCs to lymph nodes and the subsequent priming of naive T cells are similarly subject to this delay. We demonstrate that the delay in the generation of immediate lung inflammation is mediated by the influenza NS1 protein. We propose that the virally encoded NS1 protein establishes a time-limited “stealth phase” during which the replicating influenza virus remains undetected, thus preventing the immediate initiation of innate and adaptive immunity. C57BL/6, OT-I, and OT-II mice were purchased from Taconic Farms and experiments were conducted under institutional guidelines from the Mount Sinai School of Medicine Institutional Animal Care and Use Committee (New York, NY). Mice were infected in an aerosol infection chamber (model A4212; Glass-Col) with a solution consisting of 107.9 virus particles in 12 ml of PBS that was aerosolized for 30 min. Viruses used in these studies include the influenza virus A/PR8 strain, two recombinant strains, A/PR8-OT-I (12) and A/PR8-OT-II (13), an A/PR8 virus that lacks the NS1 gene (Δ-NS1) (8), Sendai virus (SeV) Cantell (SeV-C), Sendai virus 52 (SeV-52), and Newcastle disease virus (NDV). BM-derived DC preparation and infection with viruses were performed as described elsewhere (14). Total lung mRNA was analyzed by qPCR as described previously (14). Cytokine concentration from lung homogenates were determined using a 22-plex multiplex ELISA kit (Millipore). IFN-β concentration was measured by ELISA (PBL Biomedicals). Mediastinal lymph nodes (MLNs) from infected mice were incubated with Liberase (0.8 mg/ml) (Roche Applied Sciences) in RPMI 1640 plus 0.5% FCS for 20 min at 37°C to obtain single-cell suspensions that were analyzed by flow cytometry. DCs were stained with anti-CD11c, anti-F4/80, and anti-MHC-II. Intracellular viral Ag in DCs was determined with mAbs specific for hemagglutinin (clone PY102) and nucleocapsid (clone HT103). Enumeration of migratory lung DCs was performed using a high m.w. protein known as concholepas hemocyanin (CCH) (15) that was labeled with Alexa Fluor 488 to obtain C-488. Briefly, anesthetized infected mice received a single intranasal dose of C-488. Twenty-four hours after each application, MLNs were isolated, total lymphocytes were counted, and C-488+CD11c+ DCs were quantitated by FACS. For in vitro T cell stimulation assays, migratory C-488+ DCs were isolated from PR8-OVA-infected animals by fluorescence activated cell sorting at 72 hours postinfection (hpi) and incubated with CFSE-labeled OT-I or OT-II Tg T cells for 60 h. Proliferation was assessed by flow cytometry. Immune and antiviral cytokine release from DCs and epithelial cells differs depending upon the virus used for infection. Using mouse BM-derived DCs, we compared their response to influenza PR8, SeV, and NDV. Viruses lacking functional antagonists of immunity, such as NDV, trigger strong DC maturation represented by the secretion of proinflammatory cytokines (Fig. 1⇓). Both SeV-C and SeV-52 express functional antagonists, but defective interfering particles in SeV-C overcome these antagonists and trigger DCs effectively (14). PR8 poorly triggers DC maturation, but a genetically engineered virus identical to PR8 except for the absence of the nonstructural protein 1 (NS1) (Δ-NS1) stimulates robust DC maturation and a strong cytokine response (Fig. 1⇓ and supplemental Fig. 1).4 Thus, the NS1 protein is the causative agent underlying poor maturation of influenza virus-infected DCs in vitro. Influenza virus inhibits DC activation in vitro. Mouse BM-derived DC cultures were noninfected (NI) or infected with SeV-52, SeV-C, A/PR8, Δ-NS1 (Delta-NS1), or NDV-B1 (NDV) virus at a multiplicity of infection of 1.5. Supernatants were harvested 18 hpi and tested by ELISA for the production of IFN-β (A), IL-6 (B), and TNF-α (C). Conc., Concentration. To investigate whether influenza virus was capable of ablating the initiation of immunity in vivo, we analyzed the lungs of mice at different time points after infection for evidence of inflammation. As shown in Fig. 2⇓A, qPCR of total lung mRNA shows that up-regulation of proinflammatory genes was undetectable for the first 2 days postinfection (dpi). However, at 48 hpi a sudden inflammatory burst could be observed in which the expression of type I and II IFNs, cytokines, and chemokines was strongly up-regulated. mRNA encoding for the type I IFN-responsive antiviral proteins Mx-1 and ISG54 was only detected after 48 hpi, demonstrating that not even trace amounts of IFN protein were present at earlier time points. Moreover, as depicted in Fig. 2⇓B, multiplex ELISA quantification of protein production from lung lysates of infected mice shows detectable type I IFNs and proinflammatory cytokines only after 48 hpi, corresponding with the timing and magnitude of the qPCR data. Immunohistochemical analysis of lung samples shows that leukocyte infiltration begins after 48 hpi and drastically increases by 72 hpi (supplemental Fig. 2). Serum samples from infected animals were also analyzed by ELISA (supplemental Fig. 3) and inflammatory mediators were only demonstrable at 48 hpi. As shown in Fig. 2⇓ and supplemental Figs. 2 and 3, the initiation of local lung inflammation, the subsequent systemic spread of inflammatory mediators, and leukocyte infiltration correspond with the peak of virus replication. Initiation of lung inflammation occurs 2 dpi. A, Total lung mRNA from PR8-infected mice was isolated at different time points after infection and qPCR was used for quantitating the up-regulation of various inflammatory genes including IFNs, antiviral genes, cytokines, and chemokines. B, Cytokine and chemokine production during infection was determined by multiplex ELISA. IFN-β concentration was determined by conventional ELISA. KC, Keratinocyte-derived chemokine. C, Total lung mRNA from PR8-infected mice was isolated at different time points after infection and qPCR was used for quantitating the up-regulation of viral genes. D, Virus titers were determined by hemagglutination assay of RBC using supernatants of Madin-Darby canine kidney cells infected with lung homogenates from infected mice. Considering the delay in the initiation of lung inflammation, we further evaluated whether the migration of lung DCs to MLNs correlated temporally with the onset of lung inflammation. In a previous study, endotoxin-free OVA was administered once by aerosol to groups of influenza virus-infected mice at 24-h intervals, beginning at the time of infection (3). Noticeably, only when the protein was given at or after 48 hpi did mice exhibit strong Ab responses to OVA (3). If, as we suspected, the virus was triggering DCs that carry the OVA to the draining MLNs, then the migration did not begin until 2 dpi (3). Revisiting these experiments, we used an endotoxin-free, high m.w. protein known as CCH (15) labeled with Alexa Fluor 488 (C-488) to track the migration of lung DCs to the draining MLNs during PR8 virus infection. This protein is not inflammatory to DCs (supplemental Fig. 4), and its large molecular size minimizes leakage to the MLNs (supplemental Fig. 5); thus, C-488 can unambiguously be used to track cell-associated Ag transport from the lungs to the lymph nodes. Influenza-infected mice were given one dose of C-488 intranasally at different time points after infection, and C-488+ DCs were measured in the MLNs at 24 h intervals. As shown in Fig. 3⇓A, a small number of C-488+ DCs began to appear in the MLNs at 48 hpi and increased thereafter. These data demonstrate that DCs began to mobilize from the lung carrying endocytosed material concordantly with the onset of the inflammatory burst in the infected lungs. Moreover, C-488+ DCs sorted at 72 hpi from MLNs of animals infected with recombinant PR8-OVA viruses (PR8-OT-I or PR8-OT-II) were capable of driving the proliferation of CFSE-labeled naive CD8+ OT-I or CD4+ OT-II transgenic T cells in vitro (Fig. 3⇓B). 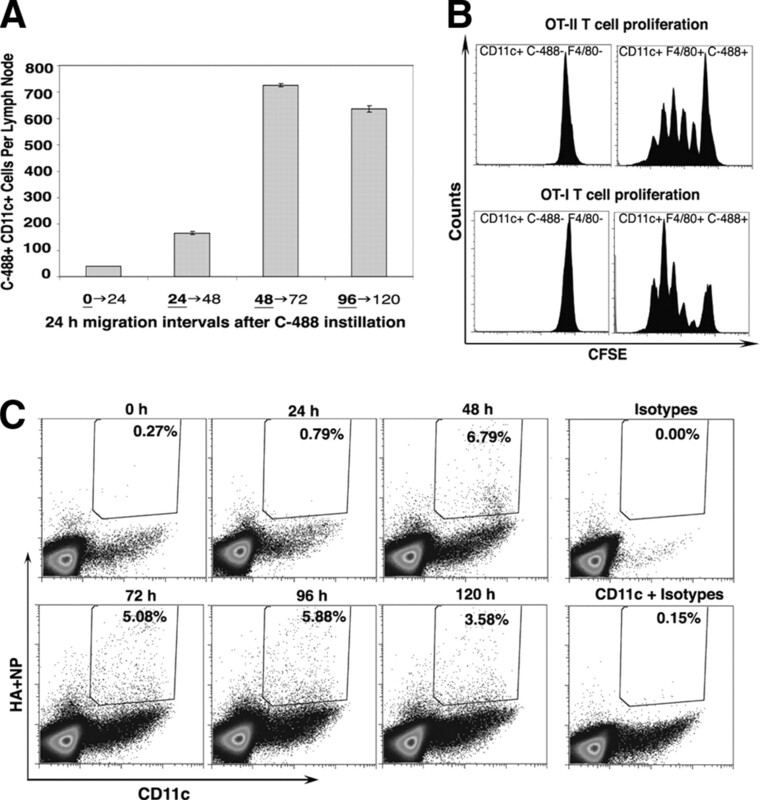 These results demonstrate that migratory DCs cotransported C-488 along with viral proteins that were processed and presented to naive T cells in the lymph nodes (Fig. 3⇓B and supplemental Fig. 6). This was corroborated by staining CD11c+ positive cells in the MLN for the presence of viral proteins. As shown in Fig. 3⇓C, viral protein-bearing DCs can be shown to arrive in the MLNs with kinetics identical with those of the C-488 positive cells. DC migration and activation of naive T cells is preceded by the initiation of lung inflammation. A, C-488 was applied once intranasally to distinct groups of PR8-infected mice at different time points after infection. Twenty-four hours after C-488 administration, migration of C-488+ DCs was assessed by flow cytometry. B, C-488+F4/80+ DCs sorted at 72 hpi from mice and infected with either PR8-OT-I or PR8-OT-II were cocultured with naive OT-I or OT-II Tg T cells in vitro for 60 h. T cell proliferation was determined by flow cytometry. C, Ag-bearing CD11c+ DCs were quantitated from the MLNs of infected mice by intracellular staining of the viral Ags hemagglutinin (HA) and nucleoprotein (NP). Viral Ag-bearing DCs are expressed as the percentage of total CD11c+ cells in the MLNs. These observations indicated that lung inflammation began at 48 hpi, increased thereafter, and the migration of DCs to the MLNs closely followed these kinetics. We hypothesized that the absence of inflammation before this threshold time (48 hpi) was an effect of NS1 antagonism. To test this hypothesis, we intranasally infected naive mice with an A/PR8 Δ-NS1 virus and compared the onset of lung inflammation with that induced by wild-type A/PR8 at various doses. As shown in Fig. 4⇓, A and B, and supplemental Fig. 7, infection with as few as 105 TCID50 of Δ-NS1 virus triggered lung inflammation as early as 8 hpi. In contrast, doses of A/PR8 virus 100 times higher than the doses of Δ-NS1 virus (and equivalent to titers observed in the lungs of infected mice at 48 hpi) were not enough to set off the cytokine response. Moreover, measurements of virus replication in the lungs of these animals at these early time points by PCR showed that both viruses had replicated to equivalent levels (influenza M protein; Fig. 4⇓B). These results demonstrate that in vivo the NS1 protein effectively blocks the production of inflammatory cytokines and the establishment of an immediate antiviral state. Lung inflammation is inhibited by NS1 during influenza virus infection in vivo. A, Naive mice were infected with different doses of Δ-NS1 or PR8 wild-type virus. At 8 hpi the up-regulation of inflammatory genes (IFN-β, Mx-1, and MCP-1) were compared by qPCR. B, Naive mice inoculated intranasally with 106 PFU of either Δ-NS1 or PR8 virus were sacrificed at 8 hpi and real-time qPCR of total lung mRNA was performed. 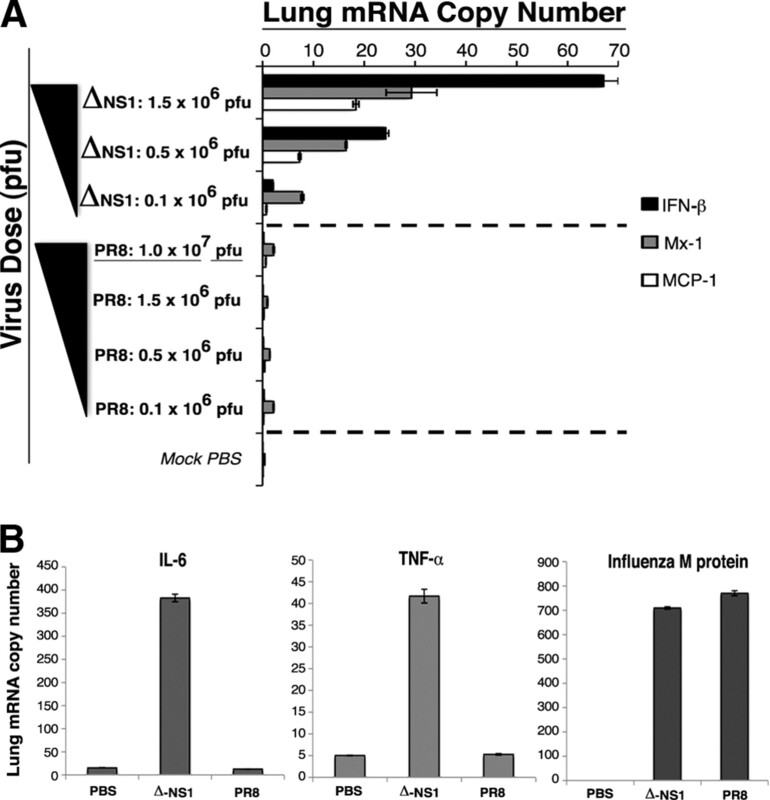 Values of mRNA expression for IL-6, TNF-α, and influenza M protein are expressed as copy numbers. The initiation of adaptive immune responses to influenza virus is a multistep process that begins with the capture of viral Ag in the lungs by DCs and their subsequent migration to the draining lymph nodes where they initiate T cell responses. Any intervention by the virus in this process will allow prolonged replication without the involvement of the immune system. In our studies, virus replication was almost at peak levels before any sign of immune activation was observed. The virus remained inconspicuous to innate immune detection (stealth phase) for almost 2 dpi because of its effective NS1 antagonism. Subsequently, a sudden burst of lung inflammation occurred, leading to the initiation of adaptive immunity by migratory lung DCs. The efficiency of the NS1 suppression is clearly shown by the lack of a response in the lungs of mice directly inoculated with wild-type virus in contrast to the strong inflammatory response observed with 100 times less Δ-NS1 virus. This was true even though the viruses have replicated to equivalent levels in the lungs of the mice at this time. The stimulus that eventually overcomes this antagonism and promotes the inflammatory burst is unknown. The eventual triggering may result from virus-derived molecular patterns occurring at high multiplicity of infection, massive host cell death, or an as yet undiscovered event (16, 17). DCs, macrophages, plasmacytoid DCs, or other immune cells present in the lung may sense these ligands and initiate the abrupt inflammatory cascade (18). Directly infected APCs (DCs and macrophages) are subject to the inhibitory effect of the viral NS1. However, DCs or monocytes exposed to type I IFNs and other inflammatory cytokines are protected against uncontrolled virus infection and gain the capacity to respond vigorously to the virus even in the presence of NS1 (19, 20). Thus, the concentration of inflammatory cytokines in the lungs and blood stream of infected animals is rapidly increased when the preactivated cells respond to virus. This cytokine exposure may well be crucial to “preprogram” DCs or their precursors that are recruited to or residing in the lung during influenza infection. Therefore, the observed blockade of the induction of type I IFNs in the lungs may serve to delay the physiological response by preventing the preactivation of DCs with enhanced APC capabilities. What additional advantage does NS1 inhibition of immunity bestow on the pathogen? Experimental aerosol infection in humans has shown that the transmission of influenza virus is maximal before the onset of symptoms that appear ∼2 dpi (21). Moreover, a comparable time course is observed in the mouse and guinea pig models of infection and transmission (22, 23). It is noteworthy that the onset of symptoms in humans occurs ∼2 dpi and correlates with the appearance of inflammatory cytokines and a drop in virus titers in nasal fluids (24, 25). Thus, a stealth phase may also occur in humans and probably functions to maximize the probability of transmission before cytokines such as type I IFNs hamper the normal replicative cycle of influenza virus. The stealth phase concept is not only applicable to influenza virus but can probably be extended to virtually all “real” human viral pathogens that have been shown to have an asymptomatic incubation time. For example, measles and varicella zoster viruses have a substantially prolonged evasion period that can last up to 2 wk (26, 27). During this asymptomatic phase, these viruses also transmit to other susceptible hosts. Research aimed at interfering with the stealth phase may lead to the development of novel modulators as preventive treatments that target this early immune evasion mechanism. We thank Dr. Paul Thomas and Dr. Peter Doherty for recombinant PR8-OVA viruses, Luis Munoz for technical support, and Sharon Czelusniak for revisions of the manuscript. ↵1 This work was supported by National Institutes of Health Grants R01 AI41111 and R21 AI077007 (to T.M.M.). M.I.B was supported by Fondo Nacional de Desarrollo Científico y Tecnológico Grant 1050150. ↵3 Abbreviations used in this paper: DC, dendritic cell; BM, bone marrow; dpi, days postinfection; hpi, hours postinfection; MLN, mediastinal lymph node; NDV, Newcastle disease virus; qPCR, quantitative RT-PCR; SeV, Sendai virus; SeV-C, SeV Cantell; CCH, concholepas hemocyanin; C-488, CCH labeled with Alexa Fluor 488; NS1, nonstructural protein 1; Δ-NS1, absence of NS1. Iwasaki, A., R. Medzhitov. 2004. Toll-like receptor control of the adaptive immune responses. Nat Immunol. 5: 987-995. Brimnes, M. K., L. Bonifaz, R. M. Steinman, T. M. Moran. 2003. Influenza virus-induced dendritic cell maturation is associated with the induction of strong T cell immunity to a coadministered, normally nonimmunogenic protein. J. Exp. Med. 198: 133-144. GeurtsvanKessel, C. H., M. A. Willart, L. S. van Rijt, F. Muskens, M. Kool, C. Baas, K. Thielemans, C. Bennett, B. E. Clausen, H. C. Hoogsteden, et al 2008. Clearance of influenza virus from the lung depends on migratory langerin+CD11b− but not plasmacytoid dendritic cells. J. Exp. Med. 205: 1621-1634. Diebold, S. S., M. Montoya, H. Unger, L. Alexopoulou, P. Roy, L. E. Haswell, A. Al-Shamkhani, R. Flavell, P. Borrow, C. Reis e Sousa. 2003. Viral infection switches non-plasmacytoid dendritic cells into high interferon producers. Nature 424: 324-328. Fernandez-Sesma, A., S. Marukian, B. J. Ebersole, D. Kaminski, M. S. Park, T. Yuen, S. C. Sealfon, A. Garcia-Sastre, T. M. Moran. 2006. Influenza virus evades innate and adaptive immunity via the NS1 protein. J. Virol. 80: 6295-6304. Lopez, C. B., A. Garcia-Sastre, B. R. Williams, T. M. Moran. 2003. Type I interferon induction pathway, but not released interferon, participates in the maturation of dendritic cells induced by negative-strand RNA viruses. J. Infect. Dis. 187: 1126-1136. Garcia-Sastre, A., R. K. Durbin, H. Zheng, P. Palese, R. Gertner, D. E. Levy, J. E. Durbin. 1998. The role of interferon in influenza virus tissue tropism. J. Virol. 72: 8550-8558. Thomas, P. G., R. Keating, D. J. Hulse-Post, P. C. Doherty. 2006. Cell-mediated protection in influenza infection. Emerg. Infect. Dis. 12: 48-54. Hikono, H., J. E. Kohlmeier, K. H. Ely, I. Scott, A. D. Roberts, M. A. Blackman, D. L. Woodland. 2006. T-cell memory and recall responses to respiratory virus infections. Immunol. Rev. 211: 119-132. Woodland, D. L., R. J. Hogan, W. Zhong. 2001. Cellular immunity and memory to respiratory virus infections. Immunol. Res. 24: 53-67. Jenkins, M. R., R. Webby, P. C. Doherty, S. J. Turner. 2006. Addition of a prominent epitope affects influenza A virus-specific CD8+ T cell immunodominance hierarchies when antigen is limiting. J. Immunol. 177: 2917-2925. Thomas, P. G., S. A. Brown, W. Yue, J. So, R. J. Webby, P. C. Doherty. 2006. An unexpected antibody response to an engineered influenza virus modifies CD8+ T cell responses. Proc. Natl. Acad. Sci. USA 103: 2764-2769. Yount, J. S., T. A. Kraus, C. M. Horvath, T. M. Moran, C. B. Lopez. 2006. A novel role for viral-defective interfering particles in enhancing dendritic cell maturation. J. Immunol. 177: 4503-4513. De Ioannes, P., B. Moltedo, H. Oliva, R. Pacheco, F. Faunes, A. E. De Ioannes, M. I. Becker. 2004. Hemocyanin of the molluscan Concholepas concholepas exhibits an unusual heterodecameric array of subunits. J. Biol. Chem. 279: 26134-26142. Idzko, M., H. Hammad, M. van Nimwegen, M. Kool, M. A. Willart, F. Muskens, H. C. Hoogsteden, W. Luttmann, D. Ferrari, F. Di Virgilio, et al 2007. Extracellular ATP triggers and maintains asthmatic airway inflammation by activating dendritic cells. Nat. Med. 13: 913-919. Kumagai, Y., O. Takeuchi, H. Kato, H. Kumar, K. Matsui, E. Morii, K. Aozasa, T. Kawai, S. Akira. 2007. Alveolar macrophages are the primary interferon-α producer in pulmonary infection with RNA viruses. Immunity 27: 240-252. Osterlund, P., V. Veckman, J. Siren, K. M. Klucher, J. Hiscott, S. Matikainen, I. Julkunen. 2005. Gene expression and antiviral activity of α/β interferons and interleukin-29 in virus-infected human myeloid dendritic cells. J. Virol. 79: 9608-9617. Alford, R. H., J. A. Kasel, P. J. Gerone, V. Knight. 1966. Human influenza resulting from aerosol inhalation. Proc. Soc. Exp. Biol. Med. 122: 800-804. Lowen, A. C., S. Mubareka, T. M. Tumpey, A. Garcia-Sastre, P. Palese. 2006. The guinea pig as a transmission model for human influenza viruses. Proc. Natl. Acad. Sci. USA 103: 9988-9992. Schulman, J. L., E. D. Kilbourne. 1962. Airborne transmission of influenza virus infection in mice. Nature 195: 1129-1130. Fritz, R. S., F. G. Hayden, D. P. Calfee, L. M. Cass, A. W. Peng, W. G. Alvord, W. Strober, S. E. Straus. 1999. Nasal cytokine and chemokine responses in experimental influenza A virus infection: results of a placebo-controlled trial of intravenous zanamivir treatment. J. Infect. Dis. 180: 586-593. Hayden, F. G., R. Fritz, M. C. Lobo, W. Alvord, W. Strober, S. E. Straus. 1998. Local and systemic cytokine responses during experimental human influenza A virus infection: relation to symptom formation and host defense. J. Clin. Invest. 101: 643-649. Moss, W. J., D. E. Griffin. 2006. Global measles elimination. Nat. Rev. Microbiol. 4: 900-908. Arvin, A. M.. 1996. Varicella-zoster virus. Clin. Microbiol. Rev. 9: 361-381.